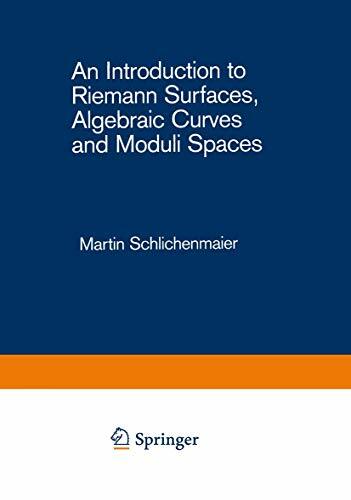 [PDF] An Introduction to Riemann Surfaces, Algebraic Curves and Moduli Spaces (Lecture Notes in Physics) | Free eBooks Download - EBOOKEE! Description: This lecture is intended as an introduction to the mathematical concepts of algebraic and analytic geometry. It is addressed primarily to theoretical physicists, in particular those working in string theories. The author gives a very clear exposition of the main theorems, introducing the necessary concepts by lucid examples, and shows how to work with the methods of algebraic geometry. As an example he presents the Krichever-Novikov construction of algebras of Virasaro type. The book will be welcomed by many researchers as an overview of an important branch of mathematics, a collection of useful formulae and an excellent guide to the more extensive mathematical literature. No comments for "[PDF] An Introduction to Riemann Surfaces, Algebraic Curves and Moduli Spaces (Lecture Notes in Physics)".